AmTech currently produces this part for several Automotive OEMs in North America. The Pilot is a cold forged part, made from SAE 1018 material. The part is attached by heat welding onto the front side of the Torque Converter assembly. It’s important to explain how this part serves as a critical guide or “pilot”, during the installation of the Torque Converter. Once mounted onto the Torque Converter, this Pilot allows a precise T/C installation into Flywheel and Crankshaft. It’s critical task that makes sure excess clearance does not appear and all bolt patterns are properly lined up. The photograph below shows how the Pilot guides the Torque Converter to be attached into the Flywheel. The rough shape of the part is created through the cold forging process. This type of manufacturing process uses vertical presses instead of the horizontal cold heading machines. 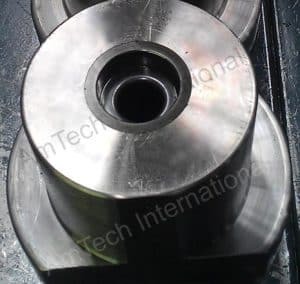 The cold forming process is highly efficient for this high volume part, because it uses dies and punches to convert the steel blank into a finished and intricately shaped part with little material waste. Once the steel material is cold formed, it is moved to the CNC Machining location. 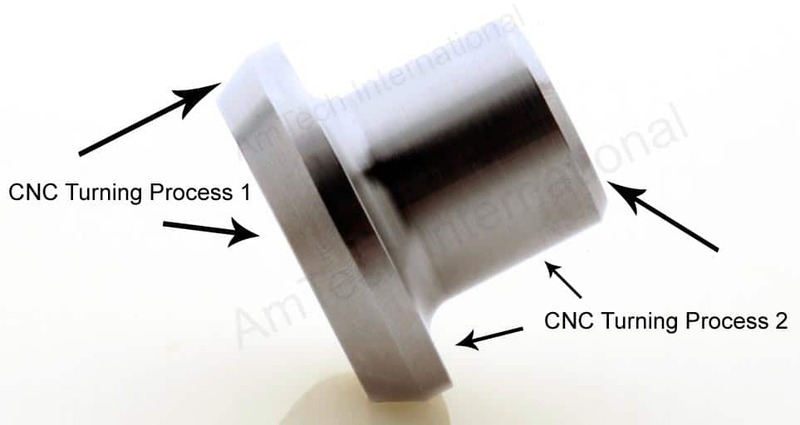 There is a two step machining process for this part. 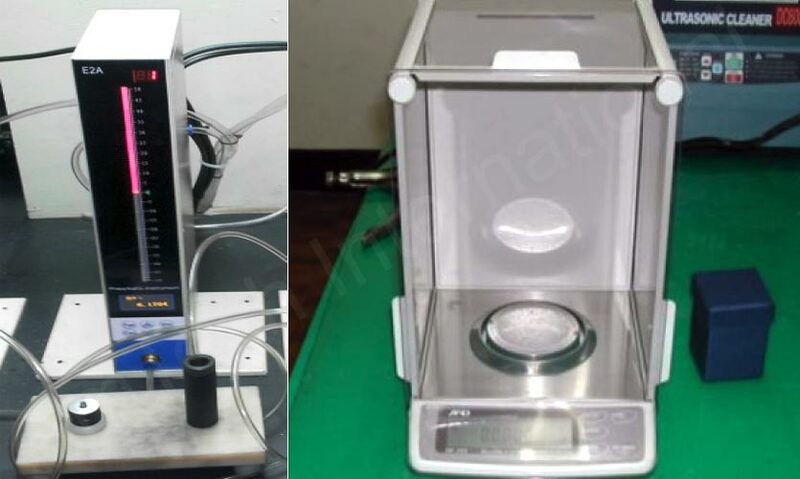 The first CNC Machine Center is set-up to machine the top section of the Pilot – outer diameter, 33.95 with a +0/-0.04 tolerance. Next, this precision component is moved by the operator to our second CNC Machine, which is configured to precision machine the outer diameter of the Pilot shaft (tolerance of this area is 0.5±0.1), which is the section that physically gets attached to the Torque Converter. Next, the parts are moved to the post machining inspection station for Air Gauge Inspection and Cleanliness Inspection & Contamination Measurement. Once the parts are inspected for potential failures such as oversize, undersize, cleanliness level or other out of spec factors, they are moved to the post process area. The parts are batch loaded into the Ultra Sonic Washing Machine to remove all machining debris. 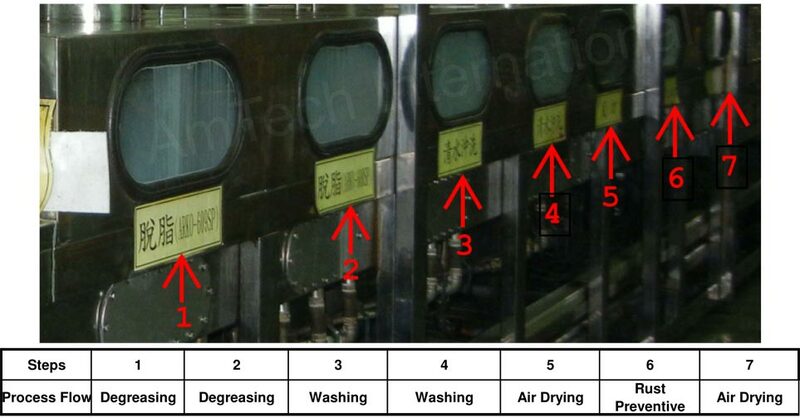 The excess machine scrap would potentially cause scratches and not meet the strict Cleanliness Class Spec of 0.25/mg per component. 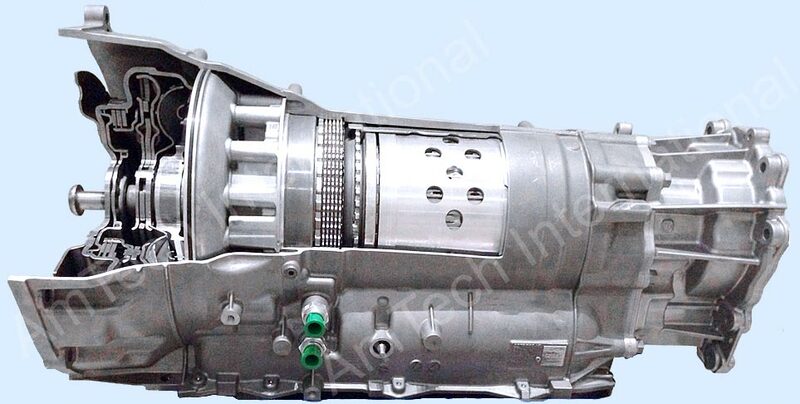 Once the parts have completed the Ultra Sonic de-greasing and washing cycles, they are immediately air dried. Next, the parts are submerged in RUST VETO 4221 corrosion preventative oil and rapidly air dried once more. The final step of the manufacturing process is the specialized packaging process to deliver a scratch free, perfect part in custom plastic trays. The plastic trays maintain the part integrity and ensure no damage occurs during transit to the OEM customer.